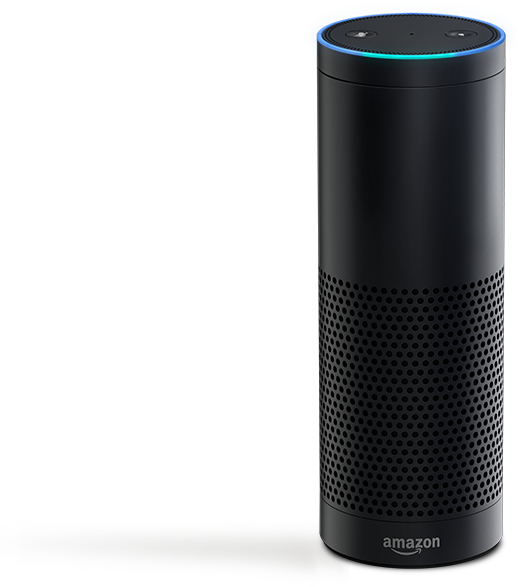 Amazon's goal for Echo is to make the little plastic cylinder, and the lady named Alexa who lives inside it, an integral part of your home. 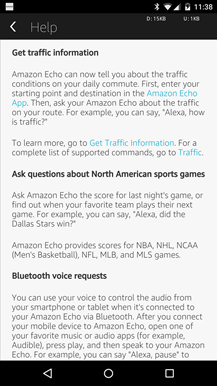 Give Alexa commands and she responds either with information you would have to look up yourself or turn on things that would require you getting up and walking across the room. Your Google Calendar is one of the things Alexa knows how to read. But now, she can also read shared ones too. Dear hyper-connected gadget lover who happens to own both a SmartThings Hub (or some of the company's many other products) and an Amazon Echo, these devices can now talk to one another. This is pretty cool, and here's why. 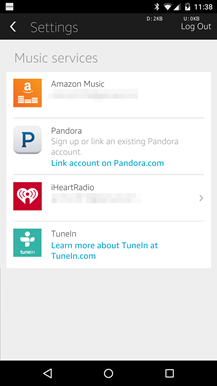 If you have your hub controlling a bunch of other devices, you can now use Amazon's device to boss them around. Alexa, turn on the television. Alexa, turn off the lamp. Alexa, have your way with whatever else is plugged into my SmartThings Power Outlet (okay, maybe this command won't work exactly as written). 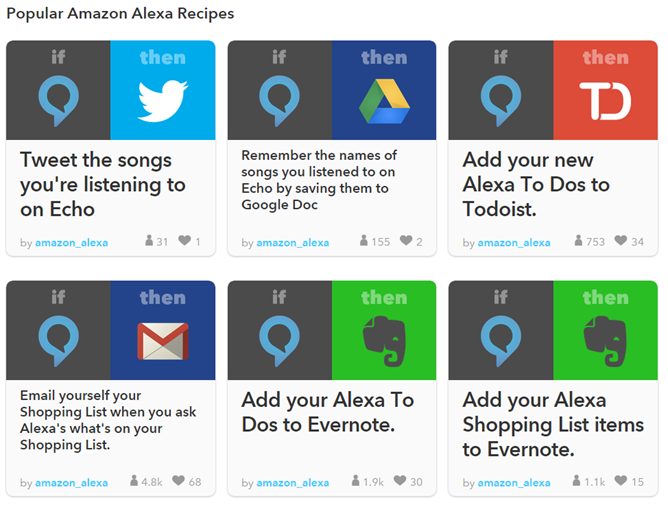 Maybe you're seeing this and you're thinking: Gee, maybe I'd like one of these Echo things after all. The Echo is Amazon's little smart tube that perks up whenever you say "Alexa" and proceeds to do whatever you say. Well, as long as what you say is something it has the capability to do. 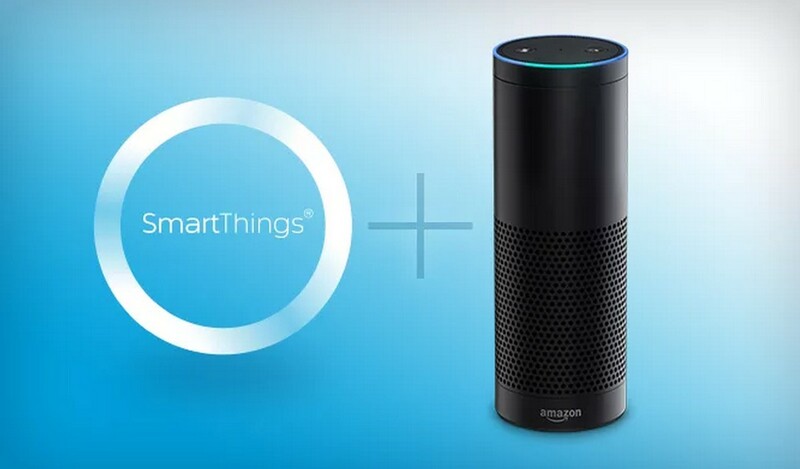 If you have a house filled with Wink-compatible products, that list now includes telling Echo to take control of your home. Try, "Alexa, turn off the fan" or "Alexa, turn on the kitchen lights." Then watch as you never burn calories getting up to flip switches yourself. 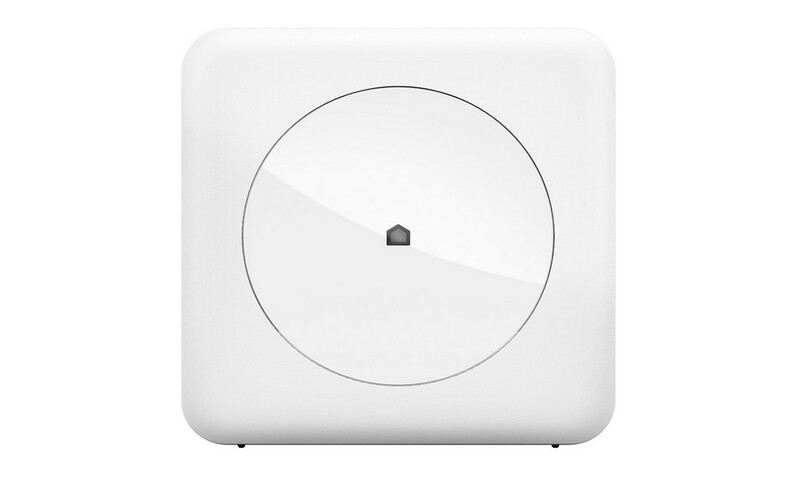 By connecting Echo to your Wink Hub, you can use your voice to control a range of supported devices. 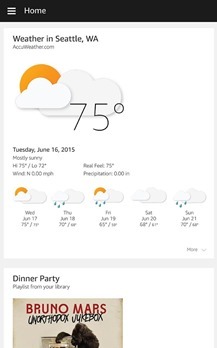 If you've been drooling over Amazon's version of Google Now and Siri (or perhaps HAL-9000... in a good way), you can now buy it without an invitation. 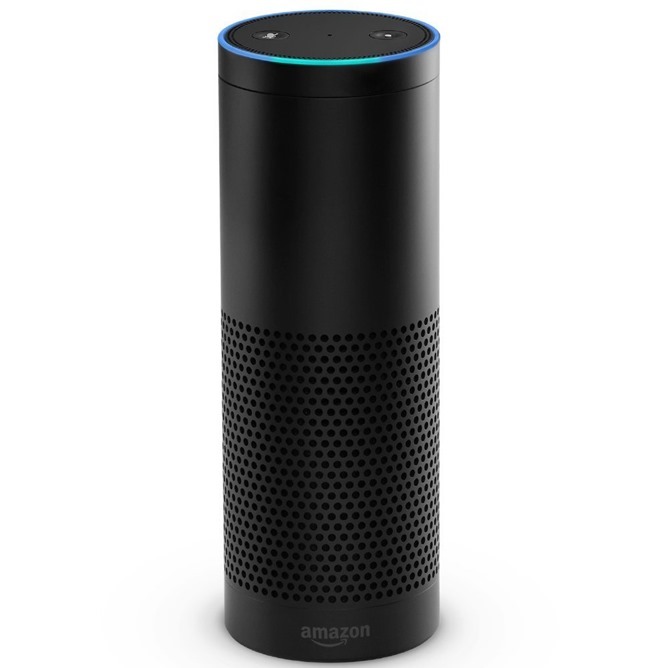 Starting today, the Echo is available in the United States for $179.99. That's $20 off of the original "retail" price, but $80 more than Amazon Prime customers have been paying after going through the invitation process. Those who purchase today will also have to wait a bit, since the Echo isn't shipping until July 14th. 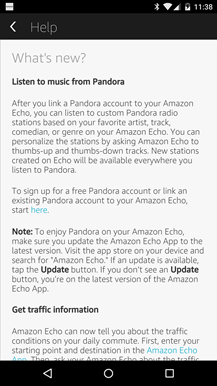 The Echo is basically a physical implementation of Google Now that ties into Amazon's services instead. Users can speak "OK Echo" or "OK Alexa" (the device's anthropomorphized digital voice) and an omni-directional microphone will record voice commands. Amazon's HAL 9000-style voice controlled gadget thing, the Echo, (yes, that's the best way to describe it in a single sentence) is gaining more capabilities with each software update. If you can get over the creepy implications of that, it's amazingly cool. 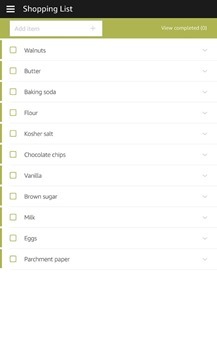 The latest update adds the capability to interact with user recipes from the popular IFFT (If This, Then That) web service. 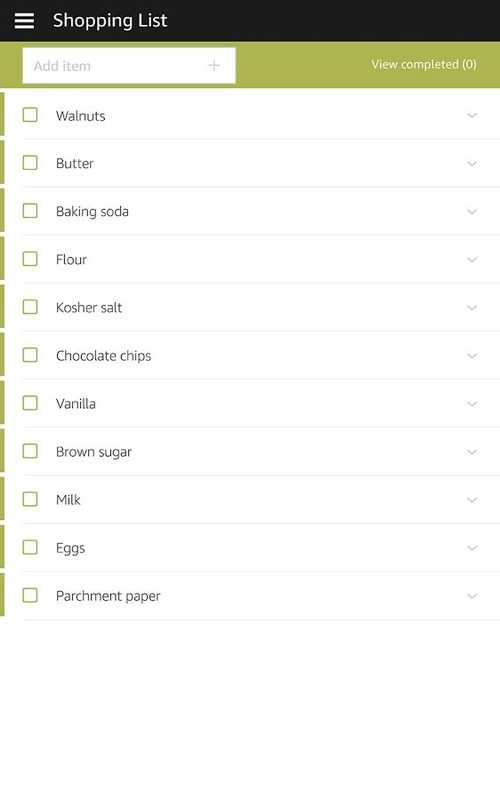 At the moment it's mostly requests for music, to-do functions, and connected gadgets. The practicality of this is dependent upon which recipes you've created or imported. The example from Amazon's promotional email is an Alexa song request that's automatically funneled through IFTTT and shared on Facebook. 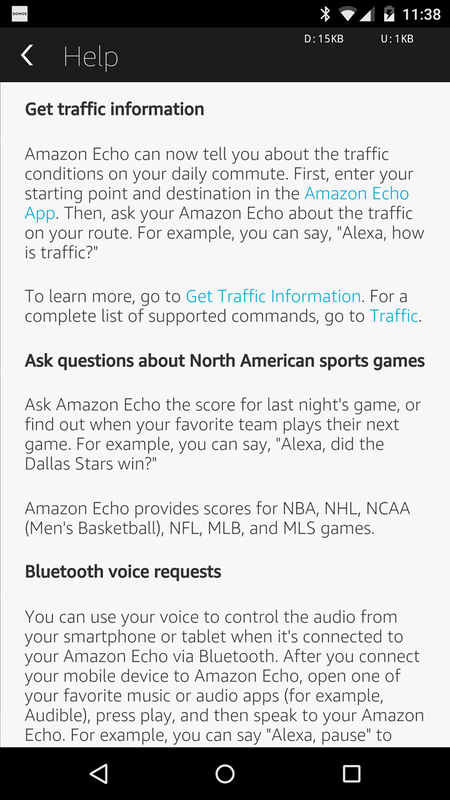 According to an email sent to Echo owners, you can now ask Echo (or Alexa, if you've allowed your semi-sentient monolith to retail a sense of identity) "What's on my calendar" to get a quick overview of your upcoming events. 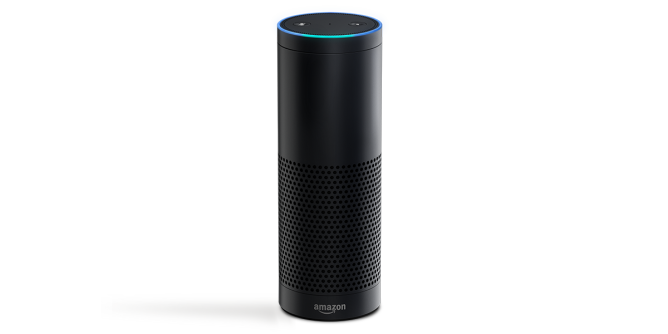 The Amazon Echo, as a sort of physical embodiment of the functionality that voice-controlled services like Google Now offer, is an interesting idea. But without a screen or much in the way of direct input, its utility is limited by the number of services that it ties into. For example, before today the Echo could only access music from iHeartRadio, TuneIn, and Amazon's own cloud music service. 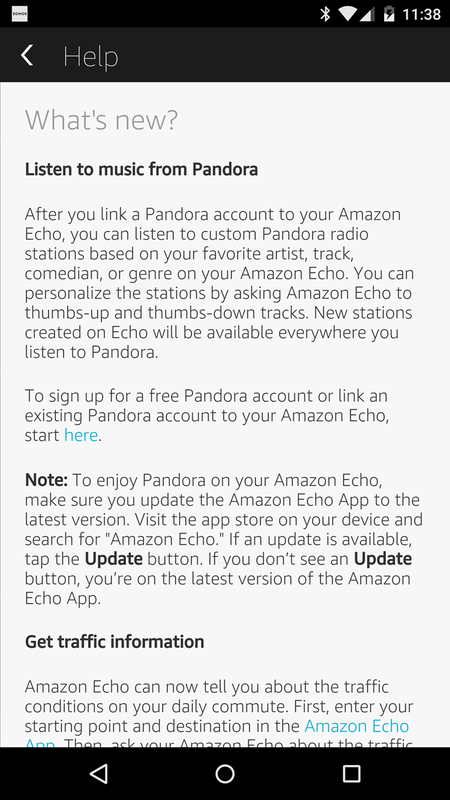 The latest software update enables much-needed support for Pandora. 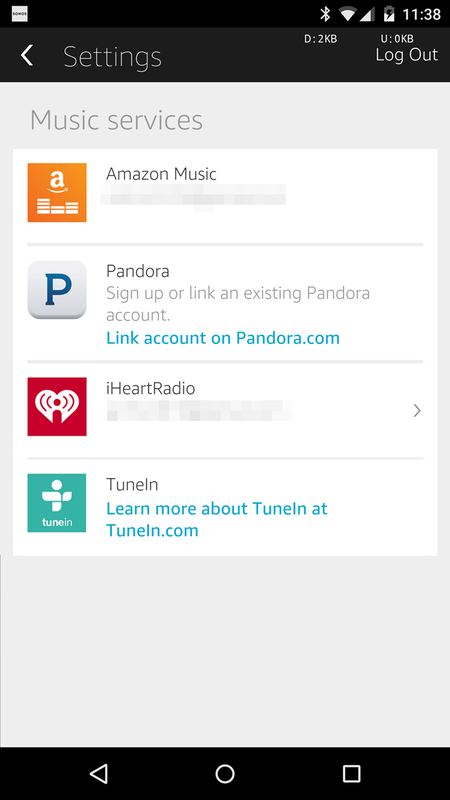 To use Pandora music with the Echo, open the Echo app on your phone and add your Pandora account details in the Music Services section of the Settings menu. A pair of Amazon apps have popped up in the Play Store, but they're both for pieces of hardware you can't get yet. 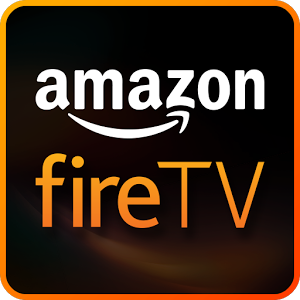 The Amazon Echo app is the companion to Amazon's bizarre connected speaker, and the Fire TV remote app adds functionality to the Fire TV Stick. I would wager the second will get more downloads. Today Amazon unveiled what may be its most peculiar hardware to date, and it's not what you would expect. It's... wait, did you hear that? Sorry, it was just an Echo. 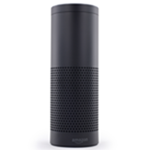 Amazon Echo is a cylindrical speaker that responds to your voice commands. 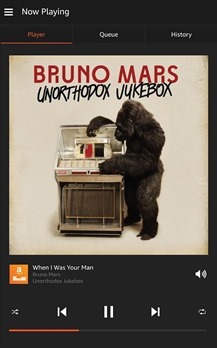 If you want music, tell it what to play. If you want to know the weather, ask it the question. It can handle alarms, pull up information from Wikipedia, or update you on the news. All you have to do is say its name and ask. The idea of essentially snatching Google Now or Siri out of a phone and shoving them into a standalone product is an interesting one.